Nakamura reverted to his more usual 1. d4 today, reversing his trend of advancing his king's pawn, which he had done to surprise opponents in rounds one and three. Kaidanov played a Catalan system, but Nakamura offered a temporary pawn deficit to activate his pieces. After Nakamura regained the material, Kaidanov's pieces could only entrench themselves and wait for the breakthrough. That came in the form of the improbable 61. f5 and subsequent king invasion. Kaidanov's rook and bishop moved listlessly back and forth while his opponent's monarch played checkers on the dark squares, taking the scenic route from g5 to h6 to g7 to f8 to e7. Kaidanov conceded defeat and now sits in a four-way tie for third, and will need some help to win his first-ever U.S. Championship. Kamsky, whose 51-game U.S. Championship unbeaten streak ended yesterday, began a new one today by winning in a fashion that echoed Nakamura's victory. GM Varuzhan Akobian eschewed his nearly-automatic French Defense and played the cramped-but-solid Berlin Defense, known for forming a nearly impenetrable wall. But it was only a matter of time before Akobian's defenses collapsed, as Kamsky's knights finally penetrated his position, capping off the offensive with the devastating 31. Nf6+. Getting low on time (Akobian was down to two seconds several times), Akobian could not hold off the attack. Third-seeded GM Alex Onischuk got back into the mix by winning a topsy-turvy game against GM Robert Hess. The Yale freshman did not control his knights as well as Kamsky. Hess's initiative began to subside after 22. Nfd4, which he called the wrong knight. Onischuk rallied for an attack on the castled king, and offered two minor pieces for a rook to prise open Hess's position. Still, it would not have been enough if Hess had played 29. Kf1, since after 29...Rxe4 30. Ne7+ Kh8 31. Ng6+ seals the win for white. “With knights, you always have to be careful,” Onischuk said. 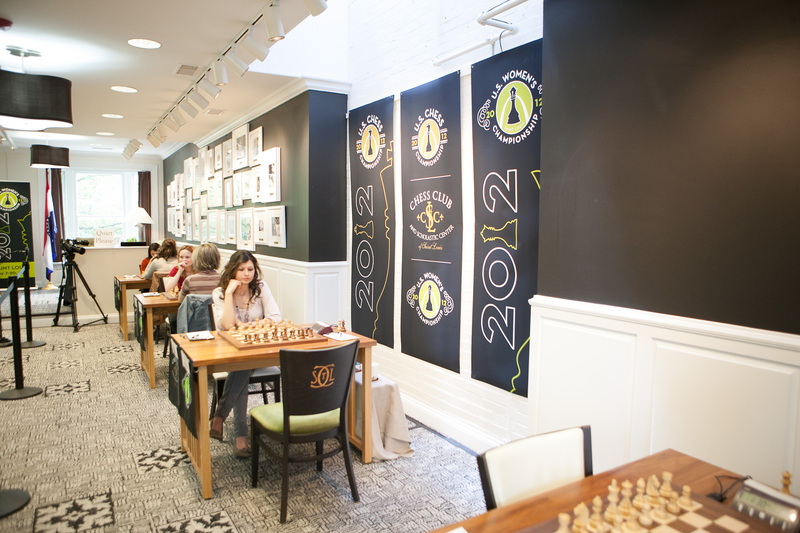 Instead, Hess made the practical decision to bring his queen backward into the defense, but Onischuk's rook eventually found daylight and a route to pay dirt – the second-rank. Onischuk played Pac-Man with Hess's queenside pawns, forcing him to resign. All three other games in the women's championship ended with white wins. WGMs Sabina Foisor and Tatev Abrahamyan both got a point to come within a half-point of the leaders. They beat WFM Alena Kats and WGM Camilla Baginskaite, respectively. Baginskaite is still without any points. WIM Viktorija Ni fought off infant-induced sleep deprivation to win her first-ever game at the championship, over IM Rusudan Goletiani, who has begun the tournament win-loss-win-loss.